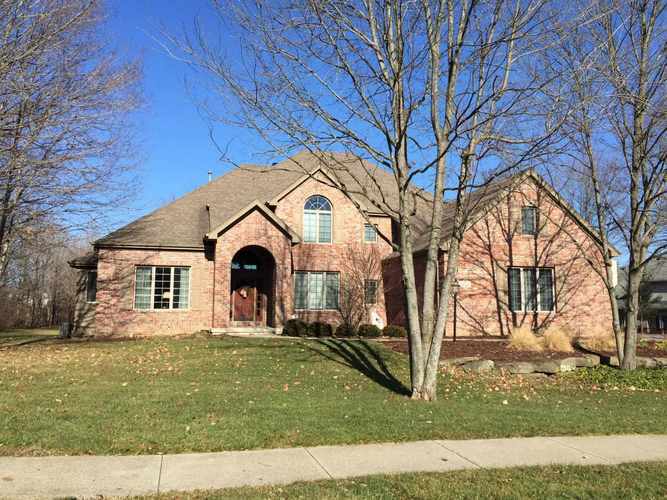 A gorgeous custom built home on a near 1-acre lot is perfect for entertaining and located in the Southwest Allen County School district. Conveniently located in a beautiful swim tennis community with 5-minute access to shopping, restaurants, I-69, and more. Over 5600 square feet of finished area for you to settle into and make your own! Main level includes master bedroom and en-suite, library/office with lovely built-in bookshelves, formal dining with tray ceiling, two-story living room with stunning backyard views, a spacious kitchen with hearth sitting area that shares a 2-way fireplace with the living room. The open kitchen has spacious granite counter tops including a bar height sitting area. Washer and dryer can stay in the separate and spacious laundry room conveniently located off the kitchen. TWO separate staircases (direct from the kitchen and direct from the foyer) grant access to the upper level. There you'll find an additional office/play/media room (32x20) with TONS of storage along with three large bedrooms and two full bathrooms (one private and the other a Jack & Jill style). The mostly finished area downstairs is very large with two more large bedrooms and a full bath as well as ANOTHER extra room that can be used as an office, work-out room, or more. The downstairs living area has an additional den/living room that is nicely divided by another 2-way fireplace - giving you two separate, but adjoining areas including a wet bar. AND THE POOL TABLE STAYS! The remaining unfinished area is perfect for more storage, workshop, and/or exercising equipment. Home comes with a one-year "2-10 Home Buyers Warranty". Directions:From HWY 24 and Liberty Mills Road, go west on Liberty Mills. Pass Homestead Road. Turn left onto Beaver Creek Court. Turn right onto Eagle Creek Pass. Home will be on your right.